Arab adventurer; born about 1490 in central Arabia, in Khaibar, as he himself stated; died in Llerena, Spain, after 1535. He left Khaibar Dec. 8, 1522, and went to Nubia in Egypt, where he claimed to be a descendant of Mohammed, while to the Jews he spoke of large Jewish kingdoms in the East, possibly referring to the so-called "Jewish realm" at Cochin, which had just attracted attention owing to the Portuguese conquest of Goa. He traveled in Palestine in the spring of 1523, and went to Venice, by way of Alexandria, in Feb., 1524. Here he claimed to have a mission from the Jews of the East to the pope, and interested a Jewish painter named Moses, and Felice, a Jewish merchant; they provided him with means to travel to Rome, which he reached in the same month, entering the city on a white horse. He obtained an audience with Cardinal Giulio and Pope Clement VII. To the latter he told a tale of a Jewish kingdom ruled over by his brother Joseph in Arabia, where the sons of Moses dwelt near the fabled Sambation River. He brought letters from Portuguese captains confirming his statements, and the Portuguese minister, Miguel da Silva, reported to his court the possible utility of Reubeni's mission in obtaining allies in the struggle of the Portuguese against Salim I., who had seized Egypt in 1521 and diverted the spice-trade. Reubeni was provided by Benvenida Abravanel, wife of Samuel Abravanel, and the heirs of Jehiel of Pisa with means for going to Almeiria, the residence of King John III. of Portugal, which he reached Nov., 1525, who at first promised him a force of eight ships and 4,000 cannon. But the king, who was at that time engaged in persecuting the Neo-Christians, found it difficult to enter into an alliance with the Jewish king, though for a time during the negotiations he refrained from interfering with the Maranos. Reubeni's striking appearance—a swarthy dwarf in Oriental costume—and Messianic predictions attracted the attention of Diego Pires, a Marano youth of noble birth, who took the name of Solomon Molko. Jewish ambassadors from the Barbary States visited Reubeni at the Portuguese court, and much excitement followed among the Maranos, some of whom even ventured to rise in arms near Badajoz. This appears to have opened the eyes of the Portuguese authorities to the dangers inherent in Reubeni's mission. Reubeni then went to Avignon to bring his cause before the papal court, and afterward to Milan, where he again met Molko, who had meanwhile traveled to the East and had made Messianic claims. In Milan the two adventurers quarreled, Reubeni going to Venice, where the Senate appointed a commission to inquire whether his project for obtaining assistance from the Jews in the East in its plans of conquest were practicable. Hereceived, however, a hint to leave Venice, and, joining once more with Solomon Molko, traveled with streaming banner to Bologna and Ratisbon (Regensburg) to meet the Emperor Charles V. and to offer him the alliance of the Jews of the East against the Turks. In Ratisbon they met Josel of Rosheim, who warned them against arousing the suspicions of the emperor and raising the Jewish question in the empire. They nevertheless persisted, and were put in chains and taken by the emperor to Mantua, where both Molko and Reubeni were examined and the former was condemned to death by burning, Dec., 1532. 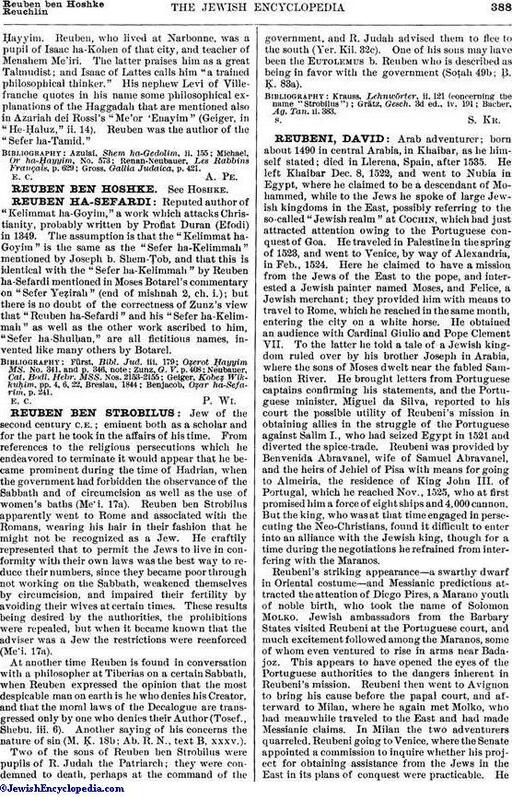 Reubeni was carried to Spain and placed in the Inquisition at Llerena, where probably he died, as nothing more is heard of him, though "a Jew who came from India to Portugal" is reported by Herculano to have been burned at an auto da fé at Evora, 1541 (see Jew. Encyc. vi. 598b, s.v. Inquisition, also Evora). 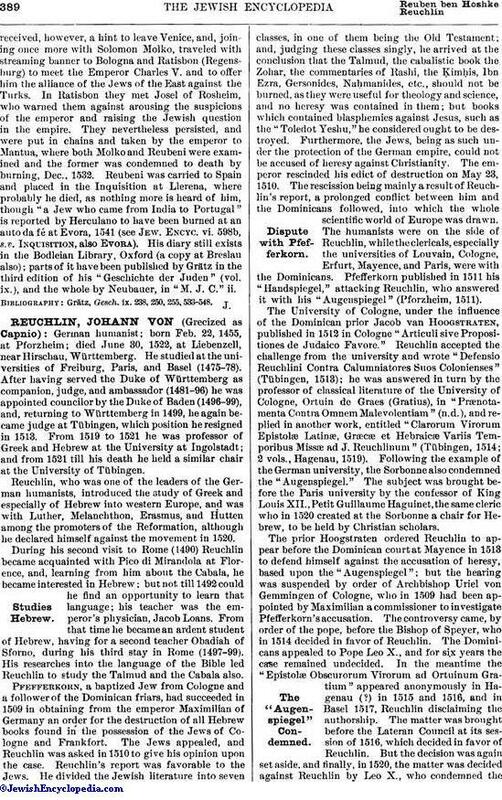 His diary still exists in the Bodleian Library, Oxford (a copy at Breslau also); parts of it have been published by Grätz in the third edition of his "Geschichte der Juden" (vol. ix. ), and the whole by Neubauer, in "M. J. C." ii. Grätz, Gesch. ix. 238, 250, 255, 533-548.